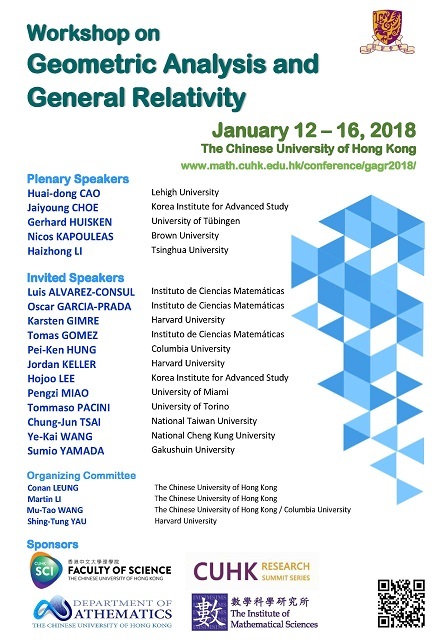 This workshop aims to bring together a small group of leading researchers from around the world whose expertise and interests lie within the realms of geometric analysis and general relativity. Over the past few decades, we have witnessed tremendous development on these subjects. This workshop will build on the most current advances by bringing together frontier researchers in the field as well as young participants, including post-docs and advanced graduate students, who are interested in this area. The fields of geometric analysis and mathematical relativity have by now evolved into a vast subject of their own, each contains a wide variety of important progress as well as open problems. Instead of comprehensiveness, the goal of this workshop is to focus on several specific aspects which has undergone remarkable progress in the past few years. 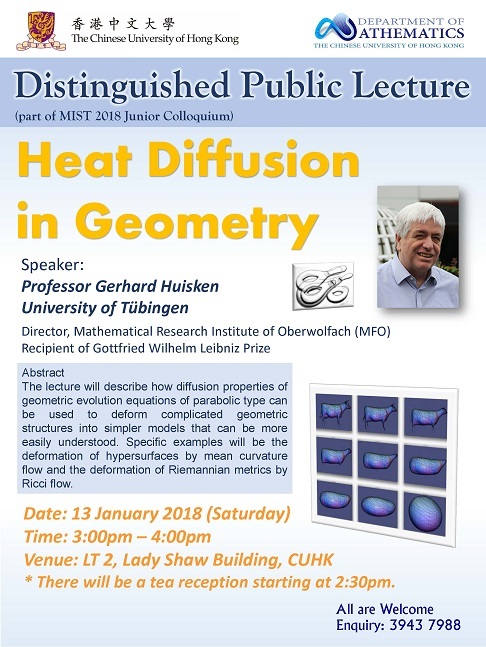 Topics include minimal submanifolds, surface theory in general relativity, geometric flows and gluing constructions in geometry. The program schedule (finalized) is available here (pdf, 40kb). You can find the Title and Abstract of the talks here (pdf, 117kb). A taxi seats at most five. The 40-minute ride costs HKD 350-400 (USD 45-50) subject to traffic conditions. Both red and green taxis are available, the red ones being more expensive. Passengers may request a receipt of payment upon arrival. The address of Hyatt Regency Hong Kong, Shatin is 18 Chak Cheung Street, Shatin. At the Airport Bus Terminus, take Airport Bus A41. Get off at Shatin Central Bus Terminus of a huge mall known as New Town Plaza in Sha Tin. However it is not the terminal stop for the bus, so ask the driver where to get off, or pay attention to the announcement, and press the red button on the rail when it is the next stop. The frequency is 20 minutes, and the journey takes 45-60 minutes depending on traffic conditions. Alternatively, Airport Bus E42 runs every 20 minutes, and it is a 75-minute trip, while Airport Bus N42 is a 1½-hour night bus route and runs at 03:50 am and 04:50 am only. You can take a taxi to the hotel. The fare is about HK$70. It will take about 15 minutes. Take the escalator in New Town Plaza, and board the MTR from Sha Tin to University. It is a 9-minute ride. The trains run every 5 to 10 minutes from 06:00 to 24:00. Click here for more information. At University MTR Station, take Exit B. You may follow the map below to go to the hotel. The hotel is a three-minute walk from University MTR Station, next to the tall white Cheng Yu Tung building. A taxi seats at most five. The 40-minute ride costs HKD 250 (about USD 30) if traffic is good. You can only take the red-colored taxi (city taxis). Passengers may request a receipt of payment upon arrival. The address of Royal Park Hotel is 8 Pak Hok Ting Street, Shatin. Take Shuttle Bus 1A / 1B / H near MTR Exit A - C or Shuttle Bus 3 near MTR Exit D. Get off at the second stop (Sir Run Run Shaw Hall). The rooftop garden opposite Sir Run Run Shaw Hall is part of Lady Shaw Building. Go there and go downstairs the reach the Lady Shaw Building. 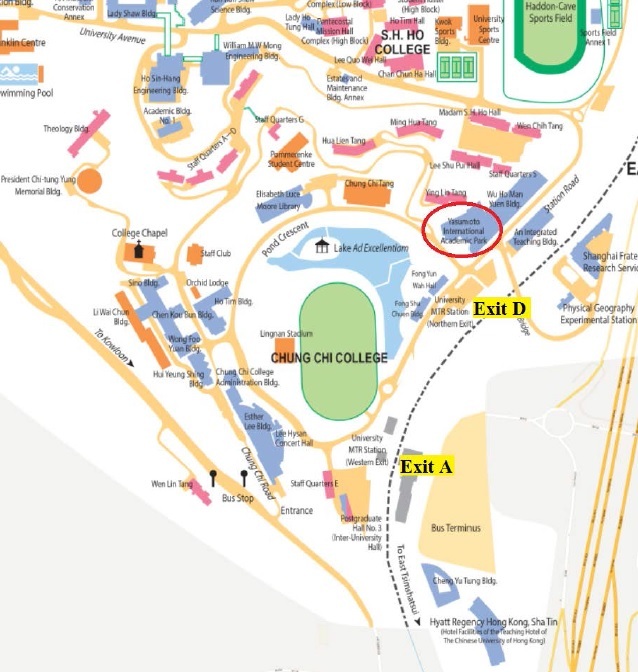 Go to 1/F and turn left to go to LT1. Enter the university through the Chung Chi College gate. Pass by the college chapel and drive to the second crossroad. Turn left. Somewhere on the right of the sidewalk is a white building with 7 stories and glass panes. That is Academic Building 1. This is a stroll that takes 10-15 minutes. Get off at Exit D and enter Wu Ho Man Yuen building opposite the road. Exit at 5/F and walk straight, past the student hostels. Cross the driveway and walk along the brick-laid Garden Road, where many sheds and pots are. After a small climb where you reach the top of a hill, turn left and descend the wavy brick road. At the crossroad (a driveway), turn right and keep to the sidewalk. Somewhere on the right of the sidewalk is a white building with 7 stories and glass panes. That is Academic Building 1. YIA is near the University MTR station. Get off from Exit A or D and take 2 to 5-minute walk. Take Shuttle Bus 3 at Yasumoto International Academic Park (YIA). Get off at the fifth stop (Residences 3 & 4). 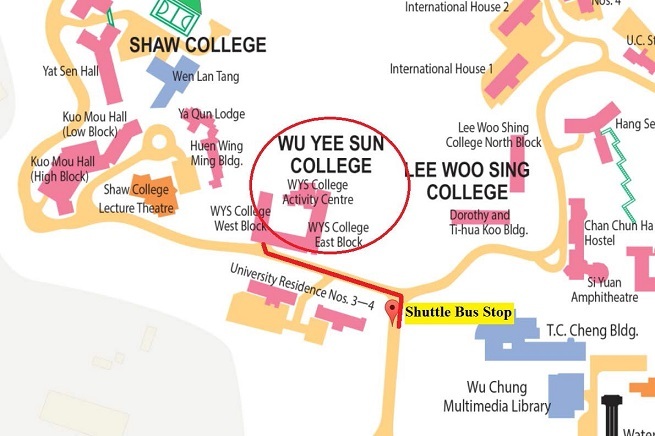 Wu Yee Sun College is opposite to the Residences 3 & 4. See also Maps & Directions at Math department website for other locations.